AFAIK all programs are running in both 3.01 and 4.00. To install, please download to /mnt/home (if you are using 4.06, please rename K-Office_400.sfs to K-Office_406.sfs) and then Menu: System: Bootmanager configure bootup, enable K-Office_400.sfs and reboot. When installed, the programs are available under Menu: Document. It has been tested with 4.00 and 4.06; the 3.01 version ahs been tested with 3.01. All functions of every program have not been tested. Thanks to mikeb, all the features of 3.01 are operative (except the Help Center). I found, again thanks to mikeb, that 3.01 and earlier must have a version 3.0 squashfs; 4.00 creates 3.1 sfs. BTW, he has a version that works with the 2.1x series--I *think* it might be the same as the 3.01 version is now. It is my observation that business and education users need a full-featured office suite. If KOffice will work as a stand-alone then Puppy users will have a choice between it and OpenOffice, each with a different style and different strengths, but either one running with all the pep of a puppy. The advantages to a stand-alone KOffice rather than a full KDE might include size and retaining the rest of Puppy/Dingo. KOffice's advantages over OOo might be that it is less than half the size of OOo and has a "flashier" graphic interface that can be fun. There is more discussion in the last message in this thread, but basically, fonts work, spell checker works, menus work, and remaining console message are non-critical (afaik). The only problems I am aware of are that 1) kchart misbehaves sometimes after choosing a Template depending on the video resolution and/or driver!?!? The workaround is to start "kchart /root/blank.chrt" The menu entry does this. Also, 2) krita starts too slowly, but it starts. what you would have to do is document which version of what libraries are being used so you can try to keep things working together smoothly. like the libstdc++ thats based on the gcc compiler in the devx_301 or devx_400 and there has been lots of write-ups how changing it and not the whole gcc and cripple compiling or programs themselves. So if anyone wanted to add to this they could follow a guideline. Anyways good luck and keep up the great work, Its an excellent Idea!! If this can be made stable - we need reports on that - also menu options need adding . . .
No extensive testing yet though . . .
F f f f f f fabulous . . .
Who is using Offices? Which is better? click on the little available icon top left after starting new . . .
i think this could become great! klauncher said: Unknown protocol 'fonts'. maybe look in your source package if you find them. and download the file for your country. extract to tmp. go to your new folder, open 'messages'. with make and make install you could install the messages for yr system (corresponding with your choosen language). it may not be perfect but it works for me in a first test. Advantage for KOffice indeed is the size of the sfs, 77MB versus 145MB, but is the KOffice suite as rich as the OOo? A certain moment I did run KDE3.5.8 with Koffice included (don't remember which version), but I had issues with ODT documents not being handled correctly in KOffice. Also there was less user-friendly functionality then. Might be better now. I might have a look however on this sfs. Location: Minnesota, USA. The frozen north. Just a quick report. I downloaded the sfs and loaded it into puppy 4.0. The basic operation of the word processor and spreadsheet appear to function. I built a small database in Kexi and did some basic data manipulation and all went well. I have only tested the very basics so far, but will mess with it some more tonight. I don't think it has the functionality of OO, but it's not bad, and for a lighter weight suite, it could be very useful. It is very comprehensive - if the size can be smaller and if we use Konqueror, it would feasibly be possible to improve the functionality of Puppy - check the drawing and structured drawing packages - AND reduce the size. For now an SFS gives the ability to try it out. I have been looking at kexi (can be compiled as a standalone package) as a potential Puppy database - however we also could do with a presentation package . . . Which is also available . . . I am interested in how the WP and Spreadsheet compare both with Puppys (I think Gnumeric is excellent) and OpenOffice? They don't look as good as they should though, I don't think, the fonts could be better and some of the graphics look odd. There is also something wrong with the fonts in Formula Editor. Fonts and graphics are things I am hoping for some advice about. Make sure you are inside the TTF directory when you issue these commands. you could use raffys tip or copy the files to /root/.fonts what also works. Subject description: What about it Aragon? Well it looks like I couldn't foist the development of the standalone KOffice off on anyone else, so I am back on it. i am still open to assistance. Please. Thanks much to aragon for all the help, also Raffy and Lobster of course. Here's how it is going. 1. KFormula fonts. DONE. Found them and put them into /root/.fonts, which I thought might be the best place for an sfs file since Puppy doesn't use that ordinarily. KFormula now looks right. Please let me know if you think another location would be better. Might be able to modify font path to include them??? Whatever is least problematical. 2. TTF fonts. DONE. i put all of them in, and KOffice looks much better. I will find out which of them are required and put those in--or perhaps see if KOffice will use liberation fonts, which would be preferable of course Please let me know if you have any suggestions. With these two font changes, KOffice looks good enough to use. 5. DONE--problem seems not to occur with layerfs=aufs. I sometimes get errors about failing to find "applications.menu in /root/.config/menus/,/etc/xdg/menus/". My previous experience with KDE is that if one watches a console, KDE generates beaucoup warnings and errors, even in a default installation from major distributions, but it still runs apparently well from the gui. In other words, in some ways it seems "normal" for kde to generate a lot of console messages, warnings, and errors, but still run within parameters--this applies to the gamin server also maybe. 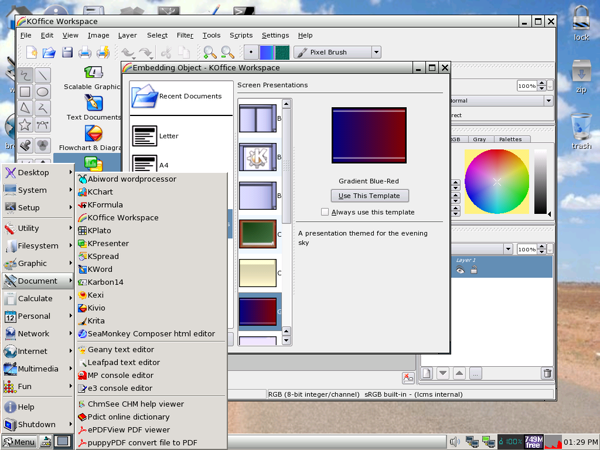 I surmise that the kde goal is to run stably as gui, regardless of messages--maybe this is "robust." This is all ongoing. 6. KChart. DONE/Workaround. Problem occurs with some combinations of video driver and resolution; seems never to occur if startup with "chart /root/blank.chrt". KChart (on 4.00) doesn't run for me beyond the intro screen. Maybe I didn't check that previously. X goes to 100% cpu and stays there. This is a show stopper. And on 3.01, KChart works fine, but Karbon crashes at that same point (picking a template and going on). Here's a NEW CLUE: KChart and Karbon behave the same way in 3.02 as they do in 4.00, different from the way they behave in 3.01. I am hoping that someone recognizes what this clue means. 7. NEXT. Khelpcenter does not work. Some required files are not installed. Well it looks like I couldn't foist the development of the standalone KOffice off on anyone else, so I am back on it. Too much too soon, or potential, with right first principles applied? Yes, /root/.fonts is rarely used in official Puppy, so you can use it. Bitstream Vera fonts convert well into/from MS Office, so I guess those are the critical fonts to have. But adding Liberation fonts will be welcome. Thanks for your renewed efforts.